We were woken early on Saturday 15 October by a storm which eased as we headed for Cleveland and the water-taxi to Dunwich to take part in the 2011 North Stradbroke Island Urban Koala survey, organised by RCC Wildlife. There were about 30 volunteers this year and we surveyed the streets of each township in small groups, beginning at Dunwich. 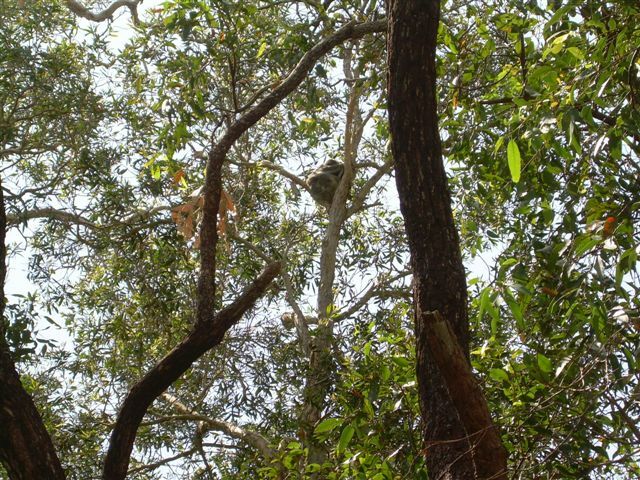 Here we found 10 koalas; then to Amity Point where we found 19 plus 1 at Flinders Beach. After lunch on the shore at Amity we surveyed Point Lookout but sighted only 1 koala there, a grand total of 31 for this year – 3 higher than last year. 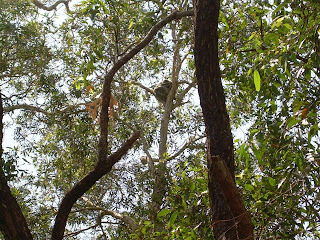 Where were the koalas which we know have been seen at Point Lookout? There have been photos and records of them and locals told us they have seen them but they seemed to be hiding away on the survey day! However, it was a good day; even the weather smiled on us – sunny and warm after the morning storm and then a magnificent storm brewing at the end of the day as we boarded the water-taxi back to Cleveland!! The rain came down as we left One Mile but cleared as we approached Cleveland leaving a double rainbow across the sky and we drove home in fine weather.